I'm not a fan of wearing gloves for anything: I hate wearing them for dishes, lab work (during school), going outside, doing manual labour... horseback riding. When fit is poor, material too thick and workmanship shoddy, it makes for a frustrating pair of gloves to wear. That all said though, I've changed my tune about wearing gloves for horseback riding. Now I have different pairs for the seasons (I reviewed the Below 10 previously) and the tasks I need to do when I ride. In addition, I keep up with Laura @ Bit by Bit's posts about gloves so have gotten some of the "work" done for me. There is a specific glove that stands out for me and I'll be discussing that in this post (note, all opinions are personal and I have not been solicited to do a review on this product--though I wouldn't oppose!). My situation: I school or hack, don't show and don't work at the stable. Ariel is usually outside in a paddock most of the year so that means I have to go out to get her--cold or hot. 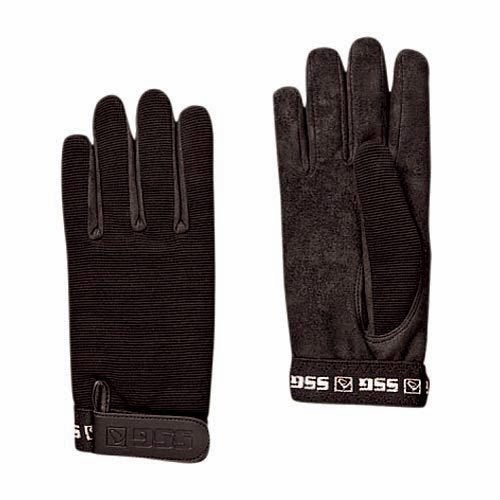 My favourite pair of gloves to date for schooling is the SSG All Weather (Style 8600). They cost anywhere from $25-35 CDN depending on where you're shopping and when (see, saaaale!). But this is probably one of the most popular and best selling pairs by SSG so I doubt they need to push it with a sale. Available Sizing: Child's 4/5, Ladies S 5/6, Ladies Univ. 7/8, Mens Univ. 8/9, Mens Large 10, Mens XL 11/12 (black only). My size actually ranges between a 5 and 6 (or even 7) and I wear the ladies 5/6 and they fit perfectly. All the features of this glove address the past negative perspectives I have about gloves and has made a glove lover out of me! I love that the elastic is adjustable and closes around the wrist so it's secure and there aren't open flaps around my wrist--it slips nicely under my sleeve of my jacket. They have great grip regardless of their status or condition. The best part is that I can toss them into the machine, wash and they come out clean and good as new. While the practical part of me has been satiated, I recently discovered that these gloves come in an array of different colours and patterns *swoon*. That's just me being facetious as the colours don't make me go any faster or ride better. I would recommend these gloves to the horseback riding newb or for those who want a no fuss glove that is versatile yet fun. interesting... i don't have access to a lot of other glove brands--are there any you recommend? SSG are the most readily available so i've tried on a bunch and the ones i've found suit my purposes (and budget). the colours make me drool a bit. which gloves do you ride with? i was checking out all your glove reviews after i wrote this post because i remember you were looking at specific gloves at one point too... needed a refresher about what you had said about the ones you tried! ah very sleek looking! i like the clean lines since it looks very versatile and can go from schooling to showing. Lesson #157: Oh the Nerves! Doesn't the Horse Do All the Work?